"Students Attack Waste Through 'Garbology'"
Our school motto is 'Developing Heart, Mind, and Community.' Seeing our community come together to make our school greener brings this motto to life. Kathryn Lee is the Director of Service Learning for Prospect Sierra School in El Cerrito, CA. In 2004, the fourth grade team was wrestling with planning a service-learning project and decided to focus on reducing waste. Prospect Sierra fourth-graders began to perform regular and thorough audits of the tons of waste produced by students and faculty. We were shocked to learn that our school generated 17,380 pounds of reclaimed recyclables, and 30,967 pounds of garbage. In addition, 2,880 pounds of potential additional recyclables were being thrown away as garbage each year — a total of about 25 tons of waste generated per year on two campuses, most of it produced on monthly pizza days. That’s a lot of waste! The waste audits earned the nickname: “garbology,” and we decided to attack the waste problem on all fronts. Soon after this eye-opening discovery, the fourth-graders delved deeper into the science of "garbology" — classroom-by-classroom and piece-by-piece. In time, they established a worm bin, published the "Recycling Times", designed their own website (www.readysetrecycle.org), and continued to learn about the importance of reducing waste while educating the entire school community – including families at home. 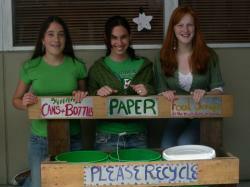 In 2007, we established a “Green Squad” elective to engage middle school students in the greening of their campus. The students built recycling bins for each of the two campuses from salvaged wood, but the bins were not being used to their fullest potential, as the school had no official school-wide recycling system -- yet. Students and teachers alike recognized the need for a system that coordinated the reduction of waste with food composting, while constructively reminding the students of the value of food. Our school starts with doing audits to collect data about the problem and to get students thinking about the issue. Students do analysis and develop creative solutions. Our approach starts with the students and learning. We created change through our Green Team, which consisted of our service learning coordinator, parent volunteers, faculty and staff. In concert with students, the team developed a plan to broaden waste reduction and recycling efforts. We set several primary goals, which were to reduce the overall amount of waste generated during lunchtime; to provide each student with opportunities to fully participate; and to take increased responsibility as individuals and as a school community. We changed the Food Service Provider to one that provided healthier food choices and less wasteful packaging, including compostable packaging and utensils. Prospect Sierra now has a successful waste-free lunch system, less waste, a thriving worm bin, and compost bins producing nutritious soil for our school gardens. Our monthly waste has dropped substantially and we have nor eliminated one of the garbage dumpsters, saving the school several hundred dollars per year from hauling fees. Our efforts were recognized when the West Contra Costa County Integrated Waste Management Authority awarded the 2006 Grand Prize for recycling to the elementary school campus, and the 2007 prize to the middle school. Starting with "waste" had led us down many other paths: reducing paper and energy waste, developing our school garden, investing in solar panels, and more. We have also switched to purchasing recycled content paper, sending our school newsletter electronically, maximizing double-sided printing, and more. We have had environmentally-themed assemblies and Parent Education nights. We have done water and energy audits that have shown our school is quite efficient. We have switched out all of our lightbulbs; we have waterless urinals at the elementary campus; we use green cleaners. We haven't eliminated waste, but we've taken big steps toward our goals, and we continue to work at them, for our benefit, and for the benefit of the planet. Caring students, teachers, staff, and parents. Also, the Board of Trustees' Building and Grounds Committee led the way on installing solar panels when it was time to replace the roof at the elementary campus. Students have been involved every step of the way, from the audits, to educating their peers, to building recycling bins, to planting and composting, to distributing CSA boxes. The commitment of students at Prospect Sierra to take the message of waste reduction home has been extremely important. Many parents and students are making conscientious efforts to pack waste-free lunches, reduce paper waste, stop junk mail, carpool to school, and more. Solutions are ongoing, but we've made a lot of progress in the 5 years since the 4th graders took on their new role as garbology scientists/waste reducers. We knew that everyone in our community needed to begin the multi-stage process of reducing waste in order to create a sustainable school and society. We were motivated by the need we acknowledged to change our relationship to the environment that sustains us, and to teach our children about healthy stewardship of the planet. Our ultimate goal is a zero-waste lunch. Everything should be eaten or taken home. We have been spreading the word among families and suggesting ideas and resources for creating a zero-waste lunch. One step at a time, students, families, staff and faculty at Prospect Sierra are nearing our goal of a zero-waste lunch. We're continuing our efforts to create an ever more sustainable school community. We are addressing all of the "Four Pillars" in an ongoing way. Greening is just a fun and interesting part of the life of our school now. We would like to focus next on reducing our carbon footprint and want to first do an audit and estimate our school's footprint. You've got to have a team. One barrier was that our Board of Trustees was reluctant to pass a Green Resolution. It helps to have support at the Board or District level, but you can make a big difference even without it. You've got to involve the kids -- they learn best by doing, and they develop a commitment and take ownership. And the voices and passions of students are what motivate teachers, parents, and administrators - they like seeing how the kids put their learning into action!